Our Milky Way is just one of many galaxies in the Universe. The Andromeda Galaxy (M31, RNGC # 224) is a large spiral galaxy and is our closest neighbor at a distance of 2.2 million light years. It has approximately 1 trillion stars. 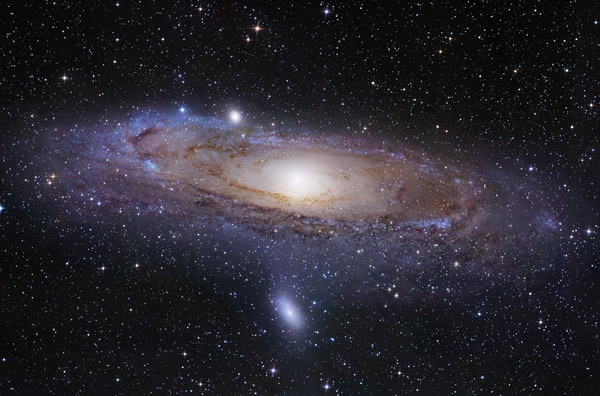 Many sources mention Andromeda as the home of several higher dimensional species. Some of these species chose to come and assist Earth in its current day Ascension progress. To adapt to a life in a 3-dimensional body, these Starseeds usually go through Antares. Information about the inhabitants of the Andromeda galaxy that are visiting Earth is usually channeled. Andromeda is not only a galaxy, it is also the name of an astronomical constellation. It is located above the constellations of Aries and Pisces. Its brightest star is called Alpheratz. Several sources, including "Branton," mention that the Adromedans are member of the Federation of Planets. There also is a strong connection with the Pleiadians. (When referring to the "Federation of Planets" some authors actually speak of the "Andromedan/Pleiadian Federation" or the "Andromedan Federation"). Some people claim to have been in contact for a long period of time with the inhabitants of a planet within the Andromeda constellation. Alex Collier is one of them. He says that "they are the oldest race in our galaxy and are very concerned about our future. They have light blue skin, but when they age, the skin becomes more white. The average age of Andromedans is 2007 years. Collier's contacts say in December 2013, we will cease to exist as 3rd density beings, and move up to 4th density. They say on Mar 23, 1994, an energy began radiating from black holes at the base of each galaxy to help in this transition. The contacts say the primate race was created by the Draconians, and first brought to Mars, then Earth. Back then, earth was closer to Mars, and covered with ice. They say humans are part of a soul group which they call Paa Tal, which were opposed to the Draconian influence and have warred with them for hundreds of thousands of years. They say that earth will be ruled by Draconian tyranny approx. 350 years from now (about 2352 AD) and have traced the shift of energy to our solar system, at (about 1995). Specifically to the earth, moon, and Mars. The Andromedan council agreed that all ET life should be removed from the earth, moon, and Phobos by Aug 12, 2003. They say there are only 2000 original grey aliens, and most of them are on Phobos, a moon of Mars. (Most of the other Greys are clones, thereby supporting the hypothesis that the grays are dying as a race due to genetic stagnation and they are looking for new DNA to revive their race.) If the aliens are not out of the moon by 2003, they will pull the moon out of orbit to 'deal with it.' They say our moon is an artificial satellite from another star system (the star Chauta in Ursa Minor). " (Quoted by Chuck Roberts in his Mystical Encyclopedia). Wendelle Stevens mentions another Andromedan contactee. In 1972, Mexican Professor Hernandez was told by one of his students, 'Lya, that she came from the planet Inxtria, revolving around Beta Andromeda (Mirach, 197 light years away). Her message mainly was one of ecological concern. Contactee Sixto Paz Wells claims to be in contact with Andromedans who look like regular humans (Humanoid phenotype): they are about 6'2" (1.85m) tall and hairless; they have small eyes and a reddish skin tone. Andromeda was the daughter of Cepheus and Cassiopeia, the legendary (white) King and Queen of Ethiopia. Andromeda was kept prisoner, chained to a rock near the sea, waiting to be eaten by Cetus, the great Sea Monster. She was saved by Perseus. (The Story is a copy of a Babylonian Story in which the Hero is called Bel Marduk).